Ever have trouble waking up in the morning? Us too. Ever feel down in the colder months or in the middle of the night? Us too. Ever have trouble focusing or feel completely drained of energy by midday? Yep, Us too. What do all of these problems have in common? They all have one solution, and it’s a pick-me-up product that has way more health benefits than caffeine — and includes an amazing sale price. 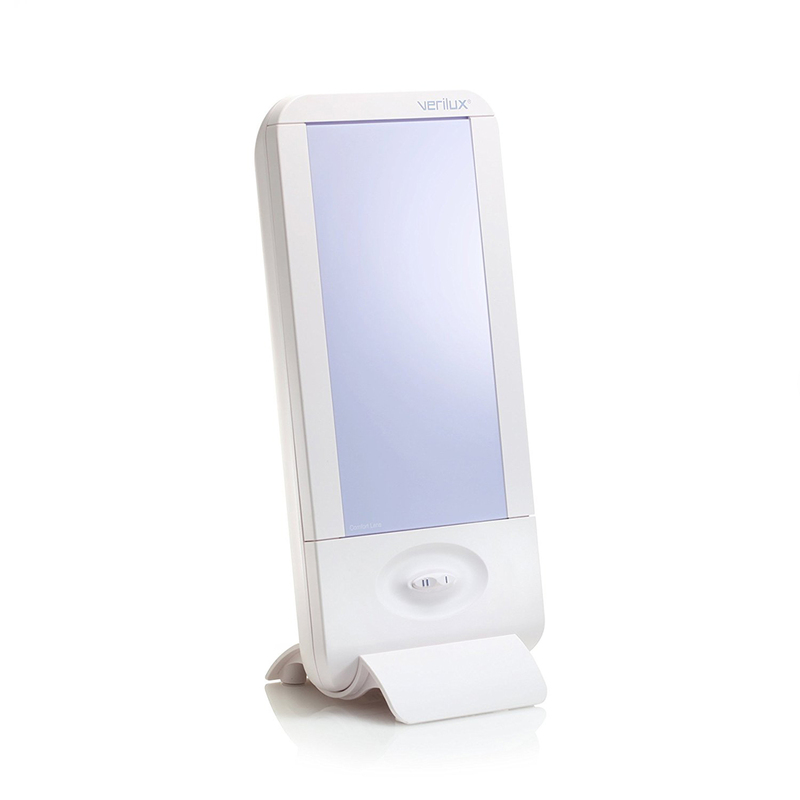 The Verilux HappyLight Therapy Full Spectrum Lamp might just turn Us into morning people. Impossible? We thought so too. But we also know that if a product is this popular, there has to be something to it. This lamp doesn’t give off a dim yellow glow or blind us with headache-inducing flashes of fluorescence. It offers us something that isn’t always available: the power of sunlight. Power is the key word here, as this lamp provides the illumination of 10,000 lux! Sounds pretty luxe, right? Bonus: no UV rays, so no sunscreen necessary! See it: Get the Verilux HappyLight Full-Size 10,000 Lux Bright Light Therapy Full Spectrum Lamp (originally $100) for $80 from Amazon! Please note, prices are accurate at the date of publication, January 23, 2019, but are subject to change. This Verilux lamp uses safe, full spectrum light therapy to target the four common areas of concern we mentioned earlier: sleep, energy, mood and focus. It’s a personal, compact size, so we can take it anywhere, but its range is broad so we don’t need to sit directly in front of it. We can move around a bit and do some yoga, or we can use it for a meditation aid if we’re looking to chill out. According to Verilux, which has been a leader in healthy lighting for over six decades, the retina “has light receptors wired to our brain [that respond] positively to outdoor light.” When it comes to sleeping, this type of full-spectrum light can help to prevent sleep disorders and, ultimately, fatigue, bad moods and bad health. When we’re exposed to bright light in the morning, our body’s serotonin production is heightened, so we feel happier throughout the day. Wake up before sunrise? Sick of rainy days? This therapy lamp can help to eliminate those problems. We’d still rather not wake up before dawn if given the choice, though. So, we know this lamp will help us to wake up, but what about when we’re going to sleep? By using the lamp in the first place, we’re resetting our circadian rhythm, and that could help us fall and stay asleep. Our body clock will be ticking away without any skips or stoppages. Sweet dreams! Better sleep not only means better moods, but it also means higher energy and advanced focus. Just by using this product one or two times a day, we can make a huge difference in our quality of life for the next 24 hours and beyond. This is especially beneficial for those who suffer from seasonal depression during autumn and winter, specifically. Getting too much or too little light? We can customize our experience with high and low settings and two anti-glare lenses that are a cinch to install or remove. Whatever feels best for Us and our eyes. Shoppers are gushing about how their new therapy lamp has changed their lives. One shopper said their lamp has seriously improved the quality of their life after just a couple of weeks. Another shopper, who admitted to being a skeptic at first, found their mood vastly improved and that they even found themselves laughing after feeling tired and down for so long. Another shopper said this lamp made them a believer, wishing they could exceed the maximum of five stars. Adding this Verilux lamp to our daily routine is so easy. Like we said earlier, it’s great to keep on our nightstand for when we first wake up, or even on our vanity for when we’re doing our makeup or taking a selfie. After all, daylight is the best light for making sure our foundation is even and for showing off our best side. Already have a lamp for early mornings? Because of this therapy lamp’s compact size, it’s perfect to take to work or a friend’s place for a BFF therapy sesh. Which gives Us an idea for a birthday gift! Don’t have time in the morning? We can do a quick 10- or 20-minute session after arriving home to recuperate after a long day and stay awake until a proper bedtime that we know won’t screw up our sleep cycle. “Veri-lux” means true light, and apart from the sun, who is sometimes too lazy to even show up, it’s one of the best mood-lifters out there. Hey, maybe if the sun is feeling so lazy it should pick up a therapy lamp too! See it: Get the Verilux HappyLight Full-Size 10,000 Lux Bright Light Therapy Full Spectrum Lamp (originally $100) for $80 from Amazon! Not into it? Check out more wellness gadgets on Amazon here! Please note, prices are accurate at the date of publication, January 23, 2019, but are subject to change.